In the late 1930‘s roads were mostly dirt. Automobiles were becoming more abundant and road use had increased considerably. With the increased use and heavy rains they became bumpy and in many cases rutty. 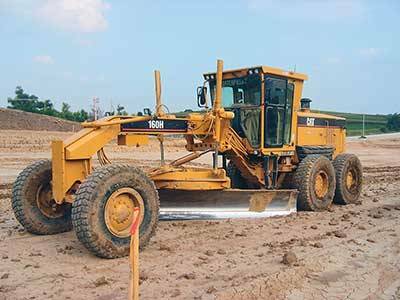 Most counties maintained their roads with grading equipment. At first this consisted only of a machine with a blade maneuvered by someone riding on it and pulled by a tractor. Later came the motor grader. It looked and operated much the same but it had its own motor and was much more powerful. Roads were “scraped” periodically but the frequency was governed largely by the weather and the usage. The soil could not be smoothed if it was too wet or too dry and a time had to be found when traffic was light. Some country roads suffered severely from the lack of maintenance. It was not until Governor Rivers was governor that the asphalt-gravel method of paving roads was used. It was a relatively cheap though very effective way of road paving. Eugene Talmadge had been governor and was a political rival of Ed Rivers. He made fun of this method, calling them, River’s “shiny” roads. On hot sunny days asphalt roads will give the mirage effect of pools of water in the road’s low places. Before this time the high cost of paving prevented places outside of the large cities being paved. The effect of World War II on the economy delayed to a degree the use of this method of paving. But by the late 1940’s most of the major roads in the county were being paved.